Billed as the oldest Mexican restaurant in Dallas, opening in 1918, many reviewers and locals also say it is the best. Now, claiming either Mexican food or BBQ is the “best” in Texas is like a restaurant saying they have the best pizza in New York City. They’re all the best in the eye of the beholder. However, after the meal I had there on the second-to-last night of my trip, El Fenix might actually be the best Mexican food in Dallas as advertised. In a way, the atmosphere reminded me of Portuguese Manor: the same style and decor, the same old tradition. El Fenix has since become a chain with restaurants all over northern Texas, but this was the original location, which will be celebrating its 100th birthday two years from now. 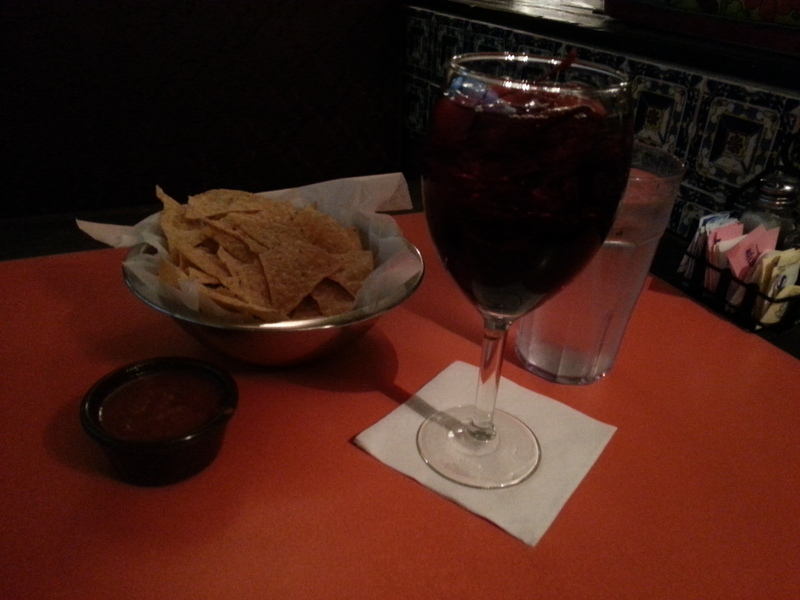 I decided to change things up and order a sangria instead of my millionth margarita. It was $4.79 and the size of the glass was similar to that of a Medieval goblet—it was huge, and not too much ice. While the taste left a lot to be desired (it was more like wine on the rocks with a cherry than actual sangria), it was still refreshing and gave my stomach a break from the lime-induced acidity of all those margaritas I’ve had in the last few days. For an appetizer, I had the small order of guacamole. This may be the best I’ve had at any Mexican restaurant. The ripeness of the avocados was just right, and there was hardly anything else in it but avocados: very—and I mean very—finely chopped onions and tomatoes, and served with a lime wedge and some cilantro. 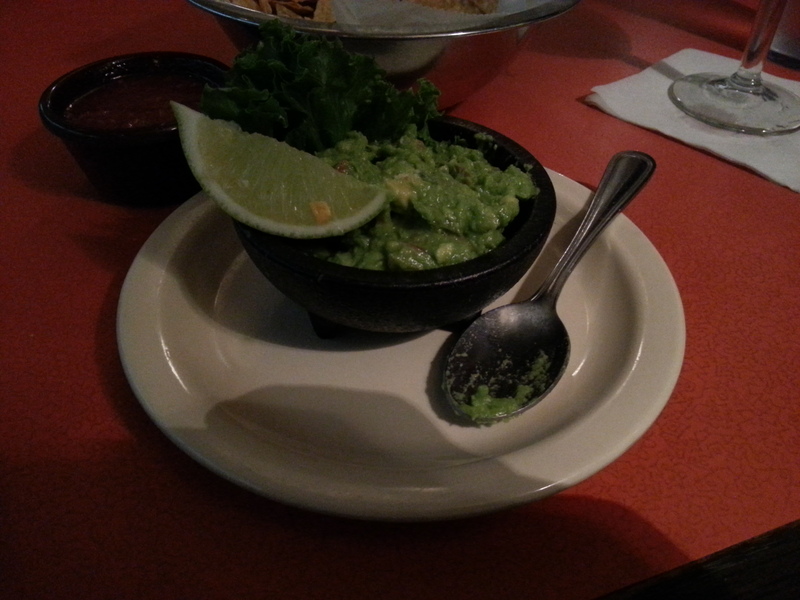 There were even whole chunks of avocado bigger than quarters throughout the guacamole. I’d be willing to believe that it was made to order, just minutes earlier. It was just that fresh, and you could taste the difference. Every table also gets a complimentary basket of chips and salsa. The chips were light and airy, and super crispy, though a lot on the salty side. 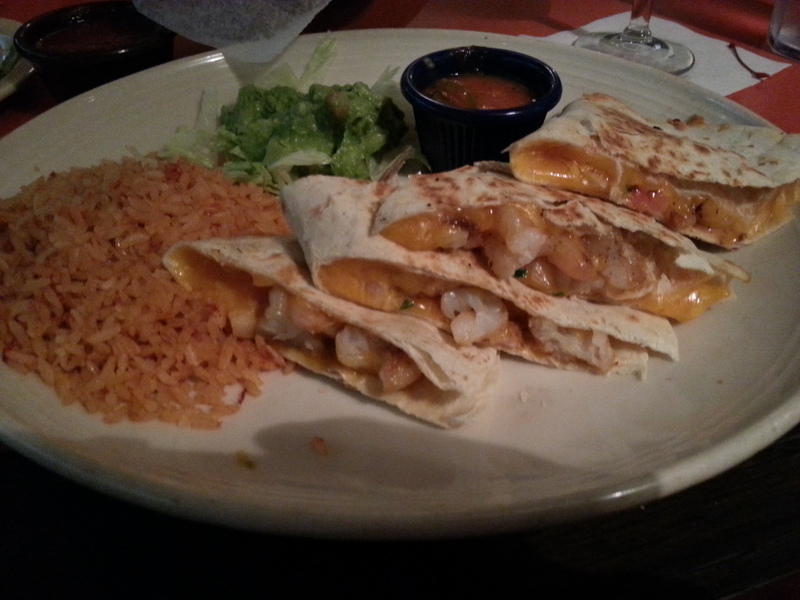 My meal was a shrimp quesadilla, stuffed with large chunks of perfectly cooked, red chili-blackened shrimp, bacon bits, pico de gallo, and more cheddar cheese than anyone should eat in one sitting. On the side came a chipotle ranchero sauce, and I was able to get an additional side of the “hottest” salsa they have, which actually was just slightly warmer than mild, and came with slices of jalapenos. The dish also came with rice and more guacamole. No one goes to a Mexican restaurant to watch their figure. The waitress was attentive and friendly, and although I was stuffed to the gills, I allowed myself to be coaxed into ordering a sopapilla. When she found out I was from New Jersey, and I said this was better than anything we have up there, she recommended the dessert. There were apparently many different kinds, including ones with fresh fruit or ice cream, but I was too full. I asked for the smallest, most basic one they had. I was served a triangular piece of puffed (and deep-fried) tortilla dough, sprinkled with powdered sugar and it came with a container (that a pancake house would have maple syrup in) of warm honey. It just oozed out of there, onto the warm fried dough. I’m glad I had no will-power to say no, because it was worth it (and also only $1.89). So, my parting words on El Fenix: best Mexican food in Dallas, hands-down. As for the best ever, Casa Rio in San Antonio still occupies a special place in my heart as numero uno. This place was a close second. 4 out of 5 stars. This post was originally published here. El Fenix is located at 1601 McKinney Avenue in Dallas, Texas.